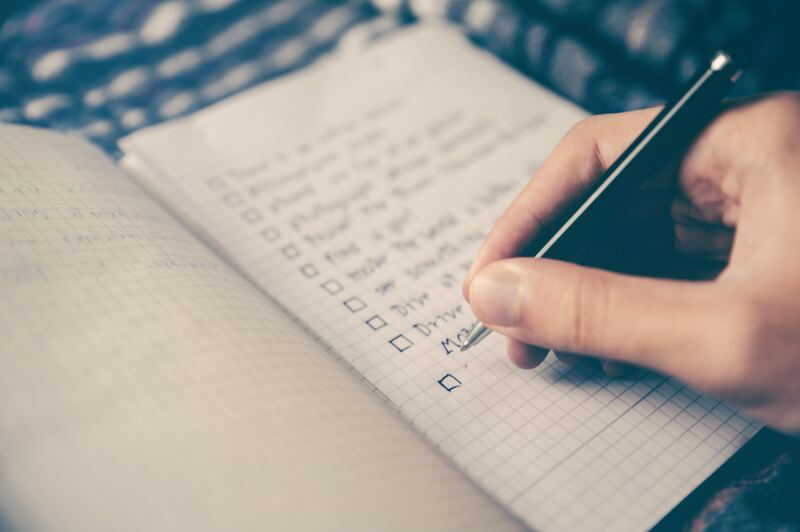 Planning my week in advance is a great way to get clear on my priorities and make sure the most important things are done before anything else. There are many ways to plan your week, but here I’m going to list out what works for me. In the past, I would focus on either longer term planning (using Michael Hyatt’s Life Plan), or simply daily planning. Now, those are both extremely valuable ways of planning your time, and they are by no means unhelpful. But the issue with focussing on the long term is of course that you can’t be very specific. You can only have these grandiose plans for the future, but it’s not really going to help you with what you need to get done in the immediate term. Don’t get me wrong, it’s helpful to know where you’re going in life. But it’s also really hard because nobody knows the future. For example, in 2015 I came up with my “Life Plan” for the next 3 years. It was full of really nice goals in all areas of my life. In some areas (e.g. spiritual and relationships) I was able to keep it fairly high level so that by 2018 those goals were still somewhat relevant. In other areas, particularly on work, it just didn’t apply anymore. The things I thought would help me advance with my career in 2015 simply were no longer relevant in 2018. This is, again, not to discard or underestimate the value of long term planning. It is simply to say that it is very hard to get it right. Moreover, I’ve been increasingly intrigued recently with the “no-goals” philosophy. Jason Fried and David Heinemeier Hansson talk about this extensively in their recent, fascinating book on how they’ve built a so-called “calm company”. I’m still not entirely sure about the value of having absolutely zero long term goals, but the idea that I should simply keep doing what I’m good at (and keep getting better at it), while leaving the rest to take care of itself is something that resonates with me. The other thing that I’ve tried is super detailed daily planning. That is, planning each and every minute of my day in advance and then making sure I stick to the plan. I did it for a while, and it helped me. I got inspired by Cal Newport’s method. I would recommend that anyone do it for at least a season, as it will really help getting clarity on how to best organise your day. For example, some of us get a lot more done in the morning, so jelously blocking a few hours from, say, 9:30 to 11:30, to close yourself in a meeting room and get some deep work done could be the best productivity hack you’ve ever implemented. While I’m currently not adopting any specific framework for long term planning, and I’m no longer planning every single minute of my day, I have come to appreciate the value of planning my week in advance. On Sunday evening (or Monday morning) I spend some time reviewing the past week, getting current on the things that I have to get done on the upcoming week. That also includes reviewing meeting notes and/or emails from the past few days, just to make sure I don’t miss out on any pending task. Then I make a list. I love the idea of the Big Three. That’s basically saying that you need to choose the 3 big items that you want to accomplish in the following week, and just get intense on those ones. That has many benefits, such as that you don’t get overwhelmed by too many tasks, but also that you can focus on quality rather than quantity. You do less but you do it really well. Unfortunately, that doesn’t really work for me as I usually have more than three things to do within a week. I try to keep my list of things to do between 5 and 7 items. It’s important to notice that at this stage, I’m not going too specific. The items that I’m listing are really projects, or portions of projects, rather than specific tasks. Once I’m clear on what’s most important for the week, I spend a few minutes every morning reviewing progress on those items and writing done what I can do today to move the ball forward. This is where I get specific. Whatever it is that I’m writing down, it needs to be achievable within the day. It can’t be too high level. I find that it’s usually a good idea to undershoot here. It’s a lot better to have a lot of small things done at the end of a day than a couple of not-quite-finished tasks that I will need to drag into the following day. Working in technology, it is only natural that when I was looking at ways to plan and track my work, I first went and looked for the best app to help me do that. But about a couple of years ago, I came across this book, and it has affected my thinking so much that I’m now a lot more inclined to use analogue solutions for crucial planning such as this. Being able to detach from my laptop or phone, alone with my notebook, and focus on what I need to get done is invaluable. Of course, there are no hard and fast rules here. While the benefits of using analogue tools for planning your life are not a mystery, there are plenty of great productivity apps. Before I went analogue, I was keeping a simple document for the current week on Dropbox Paper. It worked reasonably well. How do you plan your week? I hope this will give you some inspiration or ideas for how to plan your week and days more effectively. I’d love to hear what you’re using, and what is currently working for you. What’s your experience planning and organising your week? Share your thoughts in the comments below. To get the latest high-quality articles on technology, software development and productivity subscribe by email.